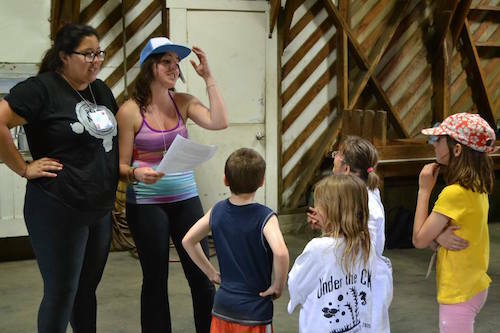 Katie Sweeney, wearing the hat, directs a group of campers with the UC Santa Cruz Camp Kesem chapter last year. The 2015 camp was hosted in the Sierra Nevada Mountains. As a child, Katie Sweeney learned to cope with her mother's cancer at Camp Kesem, a summer program for children who have parents with the deadly disease. Now the community studies major (Cowell, '16) is paying it forward. Two years ago, she founded a UC Santa Cruz chapter of the national nonprofit, which serves 5,000 children per year across 70 camps. Camp Kesem's first chapter was formed in 2000 at Stanford University, where Sweeney attended from age 7 to 15. Her mother was diagnosed with ovarian cancer when Sweeney was 7, and died four years later. "I remember telling my mom when I was 9 that I wanted to start a Camp Kesem chapter, and her just telling me that I could do it," said Sweeney, now 21. "I think the first couple years I was starting up the chapter it was really hard to separate myself from being a camper too. I was wanting to recreate the same exact experience I had." The camp grew quickly-attracting 24 campers its first year, and 61 the next. This summer, Sweeney expects around 80 children, ages 6 to 18 and mostly from Santa Cruz County, to attend this year's Camp Kesem, hosted in Boulder Creek. The camp is free for the children and teenagers. The camp is quirky. Each camper and counselor chooses his or her own moniker, said Sweeney, who at camp goes by the name "Snickers." Children sing, paint, swim, and hike. The point is not to dwell on cancer, but to have fun, she said. All 35 counselors are UC Santa Cruz students, some who've had experiences with cancer. In three years, the UCSC chapter has raised around $150,000 and attracted more than 100 volunteers, including an advisory board of Santa Cruz area professionals. On May 14, the chapter will host its "Make the Magic" fundraiser dinner at the Back Nine/Inn at Pasatiempo. Tickets are available online. Sweeney and her sister were shuffled between relatives and friends while their mother was in chemotherapy. When it became clear she was going to lose her battle, neighbors organized to leave dinners on her doorstep. "I saw my mom become really weak, and I think for any kid to see their parent kind of deteriorate before their eyes, it's a really scary feeling because they're the people who are supposed to take care of them and they're not even able to take care of themselves," she said. Supporting young campers through that experience has been therapeutic, Sweeney said. "One boy said that when his dad passed away, he felt like he wanted to pass away, too. He remembered screaming in his pillow and being so upset, but now when he's at Camp Kesem he can feel his dad playing alongside with him. That's really the goal," Sweeney said. "When I'm at camp I definitely feel like my mom is there, because this whole vision started with her." Santa Cruz resident and ballroom instructor Zak Bauman (Merrill '94, American Literature) received treatment for breast cancer last spring before enrolling her two children for the camp. Bauman said she's grateful her children found others who could understand, and she got a week by herself to heal. "My son, he came home and said, 'I'm not sure I realized how bad it could be. '," said Bauman, who is now in remission. "I think it was an eye-opener for him. They saw me come out on the other side, but that's not always the case and I think for him to see that there were kids who had lost their parents and then to see that life goes on. So, bad things happen yet we still continue to live, and what you choose to do with that is a choice."